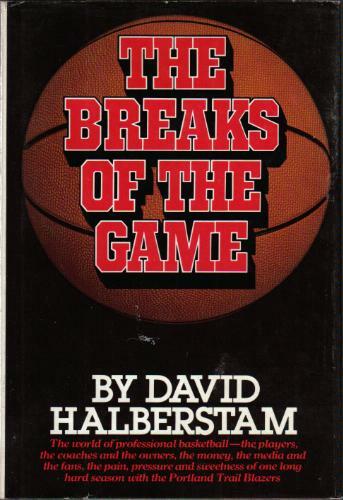 First published back in 1981, The Breaks of the Game follows the story of the 1979-1980 Portland Trail Blazers NBA season. Pulitzer Prize winning reporter David Halberstam spent the entire year embedded with the team and spent countless hours with numerous people involved with the team and the NBA throughout that season. Aside from the central theme being the Blazers season, Halberstam also details the history of the Blazers, the NBA and also the injury plagued career of Bill Walton who departed the Blazers the previous season, just one year removed from winning Portland's first championships. While I didn't really find any of the book edge-of-your-seat entertaining and I did at times find myself praying that the book finishes soon, as a big basketball fan I found it very interesting to see such a detailed look into the inner workings of the NBA back in that era. A lot of the book dealt with Basketball in the social context, it's history with race and just what's it's like emotionally and psychologically to be a player back then. I'm sure times have changed but there's so much in this book that you can see players and management dealing with in this era too. As someone who knew very little about Bill Walton's career, this book also covers Walton's story and his career in great detail which was very fascinating and even a little sad. I can't help but feel like Walton, already considered one of the NBA's greats, had his career robbed from him by injury problems. Anyway, if you're a basketball fan with a thirst for knowledge on some of the history of the NBA, I think this book is for you... otherwise, I dunno. This is a non-profit blog. If you are the owner of a copyrighted video or photo that I have used on this blog, please let me know and I will take it down immediately.